Back in the day, I used to have a serious love of collecting junk: kitschy crap from the $1 store, tacky flea market finds, the odder and uglier, the better. Things like this were totally irresistible to me. Then I discovered the magic of digital photography, and my overstuffed house breathed a giant sigh of relief. These days, I collect cole slaw recipes, which take up decidedly less room than karaoke cowboy monkeys. I've already blogged about hsa*ba's unusual Burmese cole slaw and the open sesame slaw from London's fabulous Leon restaurants. Here are two more keepers that I've since discovered, one featuring Indian spices and the other with a Thai twist. I bought 5 Spices, 50 Dishes solely for its cole slaw recipe. I loved the idea of having something raw, crunchy and refreshing to provide a light note among the otherwise deep, complex, and layered flavors that make up an Indian meal. According to Madhur Jaffrey, in India vegetables are typically cooked for a long time, allowing the spices to fully permeate the dish. Unfortunately, the resulting vegetables taste overcooked to my Californian palate. Not only has this clean, vibrant Indian cole slaw found a permanent place on my table, but 5 Spices, 50 Recipes includes several other simple salads that are equally delicious and easy to make. Per my usual m.o., I left the sugar out of this recipe, but you're welcome to add ½ teaspoon of sugar if you wish to recreate the original. 1. 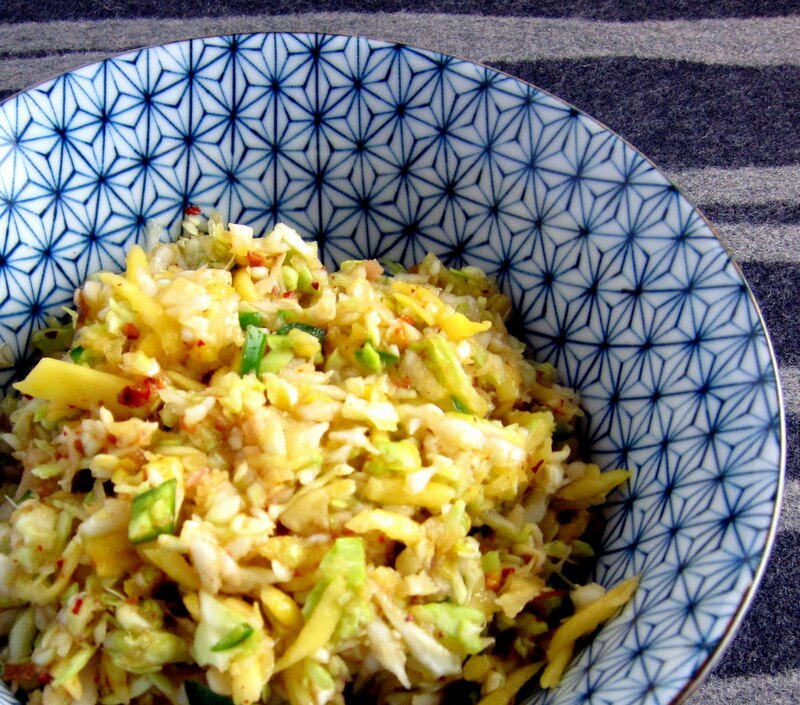 In a large bowl, combine the cabbage, chile, lemon juice, and salt. 2. Heat the oil in a small skillet and add the mustard seeds, covering the pan with a glass lid. 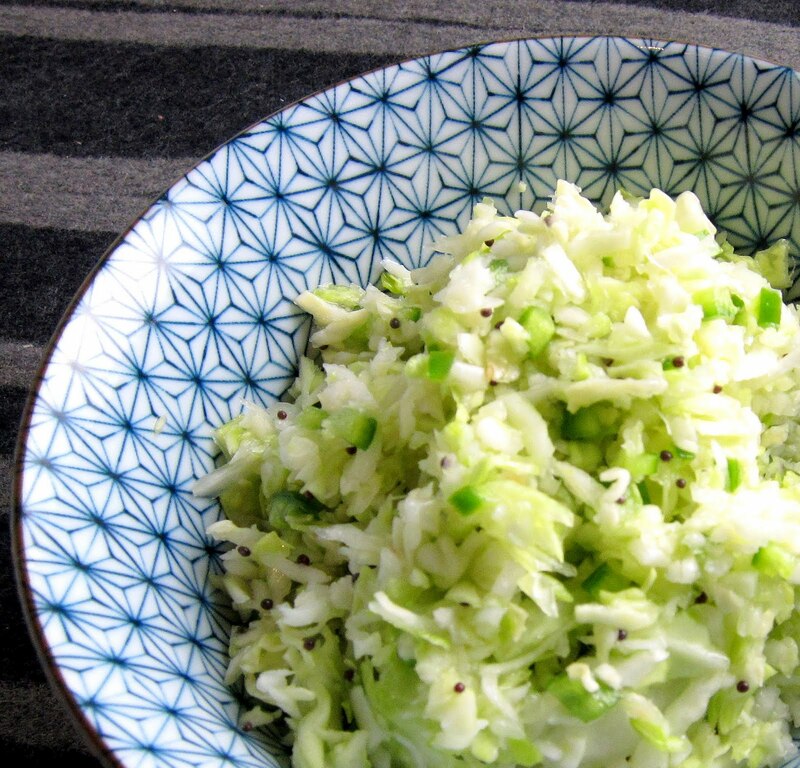 When the seeds stop popping, remove from heat and toss into the bowl of cabbage. 3. Toss well and let the salad sit for about 15 minutes at room temperature to allow the flavors to meld. The Thai cole slaw is actually just the wing bean salad revisited. You could also make a much simpler dressing of lime juice, sea salt, a dash of cayenne, and maybe a bit of chopped cilantro or mint, and toss the cabbage-mango mixture with that instead. Toss ingredients with the tamarind-lime dressing (recipe follows). You will not need all of the chili-tamarind paste to make the dressing, but it keeps in the fridge for a month and makes a great base sauce for stir fries.